There are projections that coral reefs will decline due to global warming but evolution disagrees. A number of coral species survive at seawater temperatures far higher than estimates for the tropics during the next century. We associate coral reefs with tropical seas of around 28 degrees so in that mindset even slight warming can have devastating effects on corals. But in the Arabian/Persian Gulf, corals survive seawater temperatures of up to 36 degrees Celsius every summer, heat levels that would kill corals elsewhere. Corals have adapted. Reefs are made up of many species of coral, each of which have a mutually beneficial, or "symbiotic", relationship with algae living in their tissue. These algae supply vital nutrition to the host but are sensitive to environmental changes including increases in seawater temperature. Even a temperature rise of just one degree Celsius can harm the symbiotic algae, which in turn can increase mortality in corals. 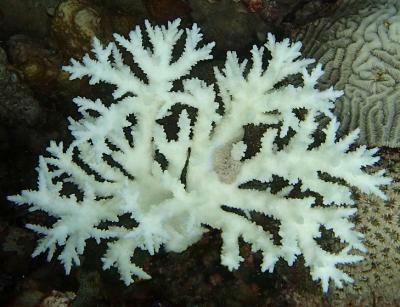 The associated loss of symbiotic algae is known as "coral bleaching" because the white skeletons of the corals become visible through the tissue depleted from the algal pigments. In their study, researchers selected and characterized model corals from the Arabian/Persian Gulf, which will facilitate future molecular-scale investigations into why they can tolerate heat stress. "We have established successful laboratory cultures of Gulf corals," said Dr Jörg Wiedenmann, Head of the Coral Reef Laboratory at National Oceanography Centre, Southampton (NOCS). "This will greatly accelerate the progress of unravelling the mechanisms that underlie their surprising heat resistance. In Gulf corals, both the coral host and the associated algal partners need to withstand the high seawater temperatures." But the scientists were surprised to discover that the algae in Gulf corals belong to a group not known for its thermal tolerance. "We see that the algae are indeed special but in a way that we did not expect," said Wiedenmann. "The algae that we found in most of the corals in Abu Dhabi reefs were previously described as a 'generalist strain' that is usually not found in corals exposed to high levels of heat stress. The system seems to be more complex than it is commonly thought but now we are in an excellent position to tackle these important questions." The Natural Environment Research Council (NERC) has recently granted funding to Wiedenmann and the Coral Reef Laboratory, so that the team can do just that. The researchers will build on their previous findings and use their model corals to investigate the molecular mechanisms that allow corals to thrive at extreme temperatures. Already around 30 per cent of coral reefs are severely damaged and more than half of coral reefs worldwide may be lost within the near future because of global warming. A better understanding of how corals respond to rising sea temperatures is important for predicting the fate of coral reefs and to optimise reef conservation. "Gulf corals are living at the limit of their tolerance," said co-author Professor John Burt from the New York University Abu Dhabi. "We have observed an increased frequency of coral bleaching events in this area, and we need to act now to protect and understand these ecosystems that hold the answers to many important climate change related questions." Published in Marine Pollution Bulletin.